Base layer, check; full fingered gloves, check; wool socks, check. I was packing again for another ride, but this one would be nothing like I've experienced before. 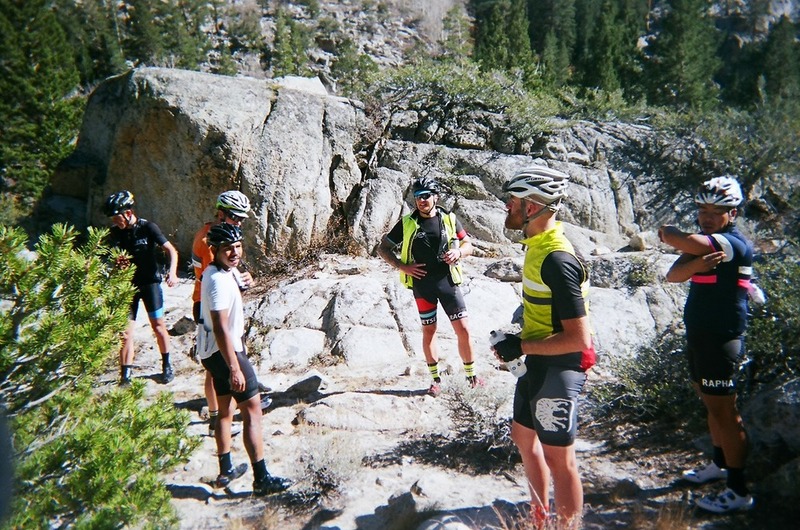 For the past month, I've been exchanging emails with my good friend Ryan Wilson, who was putting together a group ride in the Sierra Mountains with 14 other people. After going through my "things to bring" list one last time, I loaded up my car and headed north, not knowing exactly what to expect but so very eager to find out. We left on a Friday night in mid October and stayed in a cozy hostel in Bishop, Ca. I set my alarm to 5am for the following morning. After everyone had showered and got dressed, we walked around the corner to a little local cafe. It was there that we would spend the next two mornings overwhelming the poor barista with our never ending list of hot cocoas, espressos and lattes. After breakfast we drove about an hour out of town and parked at the bottom of Hwy 120 aka Tioga Pass Road. Stepping out of the car, I knew immediately that I wasn't in warm, sunny Los Angeles anymore. The morning air was crisp and a cool 45 degrees. Everyone began layering up and preparing for the ride that was ahead. As we began to roll out, Tioga Pass started at an immediate climb of a cool 5% but slowly showed me what it was all about, with its 8 and 9% grades. It was a constant battle between my body and mind riding up this winding road. On one end my legs kept yelling to pull over and take a break. On the other, my mind kept screaming to go, this is why you're here, you got this! After about 15 miles on this road, we hit the entrance of Yosemite National Park. Here we did a quick regroup and then continued to descend into the park until we reached Half Dome, where we stopped to enjoy the view. Seeing my friends together, so deep into the mountains and knowing that we cycle all the way up there was such an incredible feeling. While everyone was driving their cars, we were experiencing every turn and climb Yosemite had to offer. Day 2 began at 5am, as did the previous day. Another quick stroll to the cafe for breakfast and then we were on our way to Hwy 168. We parked our cars in a little dirt lot, geared up and we were on our way. It's funny how I thought Tioga was a struggle yesterday, because Hwy 168 was definitely testing me and my love for climbing. Steady 9% again here, increasing to 10%, and that slight 5% break, when you're like, "phew 5%, yes!" Luckily, some of the guys were still tired from yesterday's ride and decided to just enjoy today. No need to go race pace, let’s enjoy our last day and our last ride here. We decided to pull over and take a quick stop for pictures of the scenery and our bikes. After a quick little photo shoot, we continued on our ride and discovered that about a mile up, the lead pack of the group had stopped to wait for us. From here we all stayed together and the scenery began to change from green pine trees to trees covered in golden leaves. Five miles more and we hit our destination of Lake Sabrina, which sits at 9,128 ft elevation. After such a grueling climb, we were rewarded with beers out in the patio of the lodge's restaurant that sits to the right of the lake. From there we rolled over to South Lake, which is only 7 miles off the main hwy but what a way to end our trip. The last mile consisted of nothing under 12%. This lake was much smaller than Lake Sabrina but just as beautiful. After descending back down we gathered for a last lunch before everyone drove off in their own direction. This is a trip that I will remember forever. If I ever travel back to the Sierras, I doubt it will ever be with a group as large and as awesome as was able to join this time around. I am thankful that I have these pictures to remind me of all the great memories that were created. These hunts are what I live for. I can’t wait to see what’s in store for me in the months that are to come.